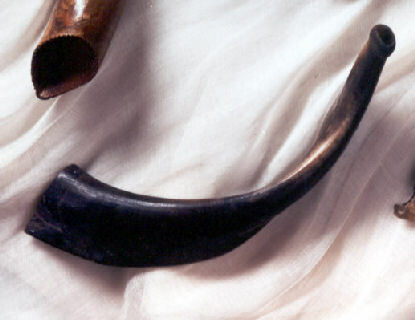 Ram's Horn (Shofar). Iraq. 19th century. B’nai B’rith Klutznick National Jewish Museum, gift of Joseph B. and Olyn Horwitz. Rosh Hashanah, commonly referred to as the "Jewish New Year," is observed on the first day of Tishrei, the seventh month of the Hebrew calendar. This is ordained in the Torah in Leviticus 23:24. Rosh Hashanah is the first of the High Holidays, which are specifically set aside to focus on repentance that concludes with the holiday of Yom Kippur. The Mishnah, the core text of Judaism's oral Torah, contains the first known reference to Rosh Hashanah as the "day of judgment." In the Talmud tractate on Rosh Hashanah it states that three books of account are opened on Rosh Hashanah, wherein the fate of the wicked, the righteous, and those of an intermediate class are recorded.